Today is my 26th birthday. I have a tendency to celebrate for a drawn out period of time. It's just more fun that way. On Saturday, Craig and his parents took me on a surprise adventure to Warwick Castle. It was so much fun! I've wanted to go there for some time now. Afterwards, we came home and ordered Chinese Takeaway from our favorite, King's Kitchen. Craig's parents spent the night and came with us to church on Sunday morning. The plan was that we were going to have a BBQ after church. The frustrating thing is, I woke up on Sunday morning with throat pain—it hurt to swallow. That's always a bad sign with me. That's how I know I am getting sick. I tried to ignore it. After all, we were having a BBQ to celebrate my birthday and English Mother's Day! But by the early evening, I was slowly going down. I started getting hot shivers and cold sweats. We measured my temperature and it was a whopping 101ºF. WHY does this have to happen to me the day before my birthday?! My husband and mother-in-law took such good care of me though, covering me with blankets and bringing me everything I asked for. I felt guilty making my mother-in-law do things for me on Mother's Day but she assured me it wasn't a problem. I am so blessed. I am so loved and taken care of. My husband even woke up early to go to Tesco to buy my some Powerade. Thank You, Lord, for giving me such an incredible family. I saw this on Pinterest this morning and I don't know if all of this is true, but I can only hope. I don't drink nearly as much coffee as some people, but I have a hard time functioning without it! I have a board on pinterest called Lust List. Occasionally, I pin things I want. Today, I decided to do something a little different. My birthday is in 5 days...so I thought I'd make a little compilation. Just in case you wanted to buy me something, but weren't sure what to buy, I've made it very easy for you. This is one of my most favorite logos I have ever seen. I love absolutely everything about this company's design sense. Of course it was designed by the geniuses at Pentagram. There's a new photo challenge going around these days. The purpose is to make people feel happy. The claim is that taking pictures for a hundred days in a row of things that make you feel happy will actually keep you feeling happy. The idea is genuine, but something is missing. What is happiness apart from the Lord? You are a mist. Your life is a mist. Basically, we are nothing apart from the Lord—and that goes the same for our happiness. But "do not be grieved, for the joy of the Lord is your strength” (Nehemiah 8:10b). All that to say, I am not slamming this photo challenge. Go ahead, take pictures for a hundred days in a row. But don't be surprised when you don't find fulfillment through it. I have a reputation among my family and friends of being a rabbit. I love snacking on raw vegetables! Today, I experienced something strange. I bought some string beans from Tesco with the intention of eating them raw (as I often do with veggies). I happened to glance at the label and read, "Caution: Do not eat raw." I was confused why it was so dramatic sounding and proceeded to google it. Now, I'm scared. This is what I found. Raw beans are poisonous because they contain prussic (hydrocyanic) acid, which is rendered not dangerous only by cooking. It was only in 1957 that prussic acid protein was discovered in string beans. A few hours after eating raw beans or bean seeds, some individuals become sick from low blood pressure, vomiting, stomach ache, circulation problems, convulsions, or heart palpitations. These poison symptoms are possible with all beans. The susceptibility to these reactions to beans is heriditary. Because they contain protein - Phasin?, raw beans can result in nausea and vomiting in sensitive people, which can be disrupted by heat. String beans nourish the blood and strengthen the nerves and bones. They help reduce high blood pressure and improve the function of insulin. However, they cannot replace medical treatments for diabetes. They are prophylactic/preventive. Correct preparation: Always eat green beans cooked or steamed -- as a side dish or a salad. Careful: raw beans are poisonous. Plant poisonings are the most common cause of calls to the poison control center. Poisonous plants include arnica, Aronstab, henbane, raw string beans, holly, dieffenbachia, yew, monkshood, foxglove (digitalis), laburnum, autumn crocus, cactus with poisonous spines, lupine, cockchafer, narcissus, oleander, castor, poppy, hemlock, thornapple, deadly nightshade, Christmas star, meadow hogweed, bryony, green and unripe potatoes, green pieces of grown potato tubers lying on the ground, and also green, unripe tomatoes and many other flowers and berries. Doctor friends, what do you think? "Maybe you shouldn't go to Creationfest...that's where all your drama starts!" Those words came out of a friend's mouth tonight. My initial reaction was defensiveness, but then I thought, is God trying to tell me something. Is it strange that all my drama (which always deals with my biggest struggle) begins on a missions trip? Is Satan attacking me to weaken my ministry? The funny thing is, I typed this on November 4th, 2011. I don't even remember which friend it was that told me that, but I definitely remember the drama that she was talking about. Ironically, this was the same year I met my husband. In fact, we stated dating about 3 weeks after I typed this out. God sure has a sense of humor! He teaches me time and time again how His plans are wayyyyy better than mine. Hopefully someday I'll learn to trust the Lord FULLY with my dreams and desires. Thank You, Lord, for constantly blessing me even though I have such little faith and am so undeserving. I always either burn them or have oil splatters all over my kitchen. What's the secret, people? Medium-low heat for 5-7 minutes per side? Something so simple shouldn't be so difficult. We all make mistakes, no? Then how can you look at someone so harshly and ridicule them for apologizing for their mistakes? Jesus said to take the plank out of your own eye before pointing out the speck in someone else's eye (Luke 6:41-42). Isn't your very condemnation of someone's apology the plank in your eye? You say that this person has done their fair share of judging in their lifetime and that they should leave the judging to God...but in saying that, aren't you judging them? You claim that you are praying that they "move forward and out of this," but are you actually praying for them? Why do you have so much ammunition against this person? Why have you researched so much that you know all the faults of this person you aren't even a fan of? 1 Thessalonians 5 says to encourage and build each other up, but everything I have heard from you thus far has been tearing down not building up. Love is patient, love is kind, love does not envy. Love is not proud or rude. Love is not self-seeking and is not easily angered. Love keeps no record of wrongs. Love does not delight in evil but rejoices with the truth. It always protects, always trusts, always hopes, always perseveres. Love never fails. (1 Corinthians 13.) Rather than holding on to our anger and hate, we as Christians should be loving towards one another. We should love one another as Christ loved us (John 13:34). As the old song says, "And they'll know we are Christians by our love." Satan will have a harder time attacking when there is a united front. that would work contrary to My purposes. of My protection and provision. Your heart can be at peace in the wildest storm. For he whose treasure lies in heaven fears no loss. and earthly things will lose their power to touch your peace. Recently, I heard of this new technology called Spritz. I've always wanted to know how to speed read and Spritz makes it possible. Try it out for yourself and you will see! Here, you are reading 250 words per minute. Here, you are reading 350 words per minute. Here, you are reading 500 words per minute. I can't wait til my kindle has this capability! It will revolutionize my life! Until then, I guess I'll just have to live with this. My birthday is in 13 days. If you are having trouble deciding on what to get me, here is what I want most desperately. I have fallen in love with this bag. It's a bright orange Fossil Memoir Satchel. Fossil doesn't sell it anymore, but that only means it can be found cheaper on eBay. You can't even imagine how happy I'd be if someone bought this for me! Last week at our women's Bible study, we got onto to the topic of Moses' bronze serpent. Today, I found myself up to that chapter in the book of Numbers. I've really been enjoying my devotions through Numbers this time around. Like I've said before, I used to dislike this book, but God has really been teaching me through it these past couple of months (yes, it's taking me months to get through this book). 4 From Mount Hor they set out by the way to the Red Sea, to go around the land of Edom. And the people became impatient on the way. 5 And the people spoke against God and against Moses, "Why have you brought us up out of Egypt to die in the wilderness? For there is no food and no water, and we loathe this worthless food." 6 Then the LORD sent fiery serpents among the people, and they bit the people, so that many people of Israel died. 7 And the people came to Moses and said, "We have sinned, for we have spoken against the LORD and against you. Pray to the LORD, that he take away the serpents from us." So Moses prayed for the people. 8 And the LORD said to Moses, "Make a fiery serpent and set it on a pole, and everyone who is bitten, when he sees it, shall live." 9 So Moses made a bronze serpent and set it on a pole. And if a serpent bit anyone, he would look at the bronze serpent and live. The metaphors in this story are incredible! God sent these fiery serpents as a judgment upon the people of Israel. 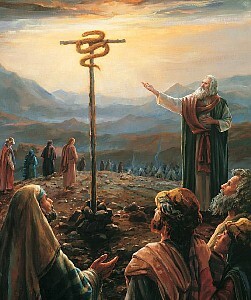 When the people repented, God told Moses to make a serpent and put it on a pole and when the people who had been bitten saw it, they would live. The bronze that Moses made this serpent out of was symbolic. Bronze is a metal associated with judgment in the Bible because it is made by being passed through fire. The serpent represents evil. Therefore, a bronze serpent represents evil being judged and dealt with, just as our sin was judged in Jesus as He hung on the cross. Such an amazing thing! Then as if God's greatest gift to us wasn't enough, He made it so easy for us to find healing and be saved. "And if a serpent bit anyone, he would look at the bronze serpent and live" (Numbers 21:9). We are saved not by doing anything, but by simply looking to Jesus. For I am God, and there is no other." With a cup of faith and one of hope and one of charity. And also the ability to laugh at little things. Moisten with the sudden tears of heartfelt sympathy. Bake in a good-natured pan and serve repeatedly. Yesterday, I woke up with this terrible neck pain! (Unfortunately, all my unused Icy-Hot Patches are in my desk drawer...in California.) It's quite paralyzing, being unable to turn your head and having to turn your whole body to have a conversation with someone. It's also painful to just sit up and do nothing. The only time I feel okay is when I lay down. But then, how productive can I be?! I woke up this morning with the pain only partially gone. But that got me thinking—thinking of how blessed I am that this is only a sparse occurrence. Thank You, Lord, for my health. Thank You that I don't live in constant pain or constant misery. Help me to be less of a complainer and more of a rejoicer and a praiser. Help me to remember that You are good. FINALLY! I was so ready for this blog challenge to be over...and today is finally here! I like blogging and sharing my life with you all out there (whoever you are!) but it's easier without a daily prompt! A couple days later, with the help of YouTube, I learned! This was my first project! This is me in Amsterdam. Craig and I were there for the half term holidays a few weeks back. LOVED it. Speak Up or Lift Up. One of the most painful things is following the lives of old friends who have walked away from the Lord. Social networking rubs all their actions in my face on a constant basis and I'm left wondering if I should unfollow them or continue to subject myself to this depression. When do I give up? Should I even say anything to these people? I know the Lord never gives up on us, but am I just casting my pearls before swine? Am I trying too hard to fix other peoples' problems instead of lifting them up in prayer? Lord, please give me wisdom. I need to know when to speak up or lift up. Day 28: Do you wish for anything at 11:11? If so, what do you wish for? Day 27: a picture of your handwriting. I've been really bad about posting. This 30 day challenge, I found myself picking and choosing which days I took part in. I'm still disciplined though, don't worry. 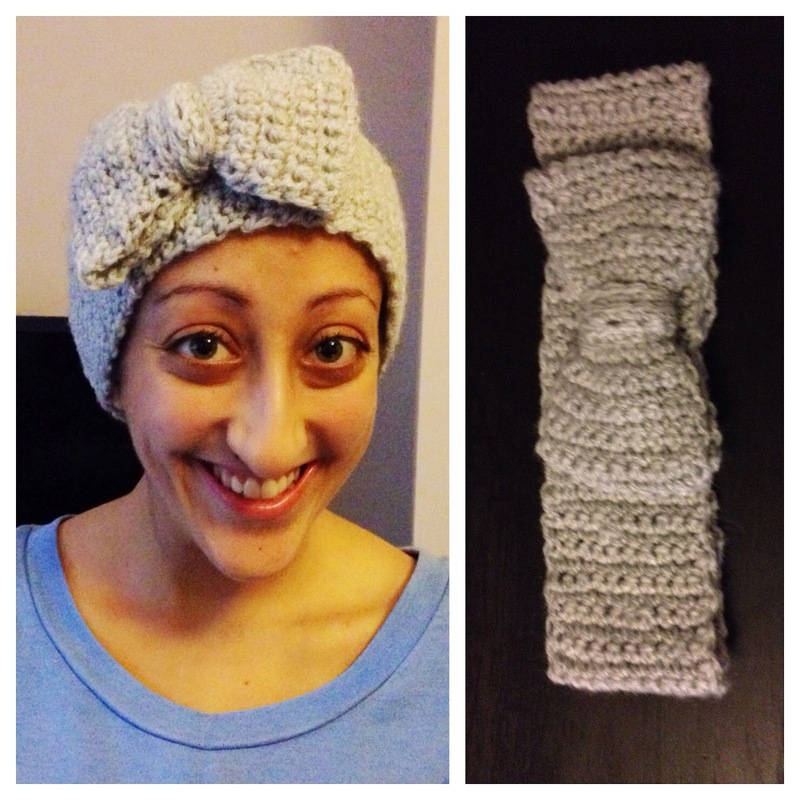 I even taught myself how to crochet yesterday...see? Oh, and I almost forgot about the handwriting thing. Just look up.^ My blog logo is my handwriting! How can people go outside and not believe in God?! I haven't heard from Craig in a few hours...is he okay? !